The incessant buzzing of electrified door hardware can drive people crazy. Is noisy door hardware the norm? In this note, we examine the causes of 'noisy' door hardware, examine the business case for buying 'quiet' hardware, and compare the cost of 'quiet' technologies to common alternatives. Hardware noise occurs when the solenoid, the heart of these devices, gets energized. When a credential is read, the system automatically energizes hardware so the door can swing open. Take an exit device, for example. When 'secure', the device unpowers the solenoid (quiet), and throws the latch. When activated to permit entry, the solenoid is powered up, and the latch is retracted, allowing the door to swing open. This problem is significantly mitigated when using DC only powered solenoids (versus the more common AC). Instead of polarity reversing rapidly 60 times per second, a strong steady impulse of power in one direction holds the solenoid thrown. The only noise that emanates is whatever is physically created by the solenoid to hold open the strike. Typically, AC powered solenoids can produce ~70 - 80dB of sound, while DC powered solenoid device produce ~20dB. (Decibel comparison charts denote a quiet library typically measures 40 dB.) However, depending on device, this power selection may influence performance like speed of movement, heat produced (efficiency), or gauge and distance of wiring. Alternatively, products like the Adams Rite ES or SDC Quiet DUO latch retraction kit further reduces this noise by getting rid of the solenoid entirely. Instead of the solenoid being continuously energized, it uses a motor to to drive and pull the latch open. A geared assembly is used to pivot the latch in and out of position, and the motor only is energized in pulses when moving the assembly. 'Ultra quiet' motorized hardware versions produce less than 10 dBs, notably less than even DC powered solenoids (though 20dB is quite low itself - less than a quiet bedroom at night). Controlling noisy openings may be important in several types of buildings. Hospitals, hotels, and libraries all desire quiet operations, and eliminating the constant buzz of doors being opened maintains peaceful environments. Other applications may include waiting areas next to main entries, where the high-cycle opening of doors may disrupt patrons or patients. For no additional cost, solenoid driven hardware can be adjusted to operate quietly. In recent years, devices allow 'field selectable voltage' and will operate with either AC or DC power. As a result, the 'noise' of hardware is something controlled in power supply design. Choosing a DC power supply to operate these devices mitigates noise. If you need something very quiet, specialty items like motorized 'ultra quiet' SDC Quiet DUO are available for ~$425. However, this device is ~$100 more than 'traditional' solenoid assemblies. 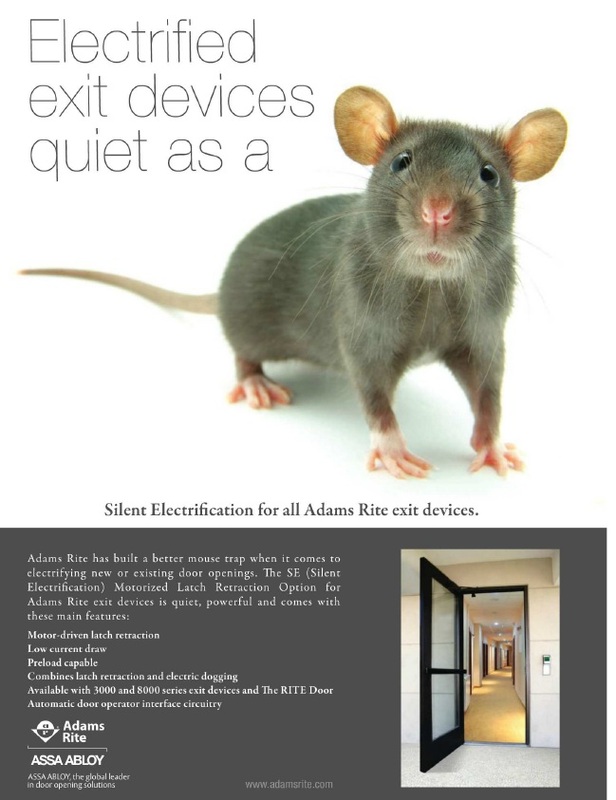 Interestingly, despite several trade magazines running full-page ads, pricing for the Adams-Rite SE device is not yet available, and we are unable to include it in this report. When pricing hits the street, we will update this post accordingly.